It could be said that your roof is the most important component of your home or business – it protects you as well as all your valuable possessions inside. So when it’s time to hire a roofing contractor, you want to work with a company of roofers that is experienced and provides you with superior materials and workmanship. Nickerson Roofing is that kind of roofing company, one that you can trust to help you select the right products, determine the job scope, and install, repair or replace a roof that is correct, clean, and complete. We are the home and commercial roofing contractor that can help you preserve your property for years to come. Call us for a free consultation today! Serving the Truckee, CA and surrounding areas, Nickerson Roofing has attained high standards from over 25 years of experience. We use top-quality products and we strive to be the best in the business. We are professional roofers that can inspect your current roof condition and make expert recommendations for all of your roofing needs. With years of experience, along with our roofing equipment and quality roofing materials, we can repair or replace any residential or commercial roof. And we do much more than just roofing. We also offer service on Gutters / Gutter Guards, Skylights, Sun Tunnels and Roofing Insulation. 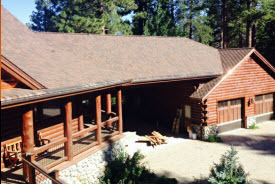 Nickerson Roofing works on all kinds of roofs found in the North Lake Tahoe Basin of California! We don’t just install, replace, inspect, repair and maintain roofs! Nickerson Roofing also offers other specialty services such as insulation, gutters, gutter guards, screening, skylights and sun tunnels. Storms in Truckee California and surrounding areas can have a real impact on your roof and home. Call Nickerson Roofing for emergency storm damage repairs!